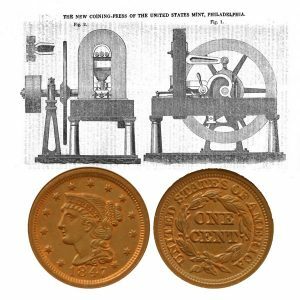 Today, the Large Cent Coin remembers the first day the US Mint used its new steam coin press 181 years ago. As an employee of the US Mint, Franklin Peale made several mechanical improvements to the processes for making coins. One, the steam coin press, began operation on March 23, 1836. Description of the New Coining Presses Lately Introduced into the United States Mint, Philadelphia. To the Committee of the Franklin Institute, on Publications. Gentlemen, After seven months of experience, it will not be considered premature, to send for publication, a brief notice of the Coining Press, a model of which I had the pleasure to exhibit and describe, at one of the Conversation Meetings at the Institute last year. This press has been in operation since the 23rd of March, last, the period of the first coinage by steam in the Mint of the United States; and the results, which are more than satisfactory, have authorized us to proceed with the most perfect confidence in the formation of the presses for the branch Mints at New Orleans, and at Charlotte and Dahlonega, in North Carolina and Georgia; also, with the manufacture of others for the use of this Mint, all of which, it is probable, will be completed at an early period in the coming year. The above design exhibits a side view of the medium-size press, intended to strike eagles, quarter dollars, and cents. Three grades have been adopted, corresponding in linear proportions to the numbers of nine and a half, seven and six, suited to all the denominations of our coin respectively. The side view (fig. 1.) exhibits the general proportions and arrangements of parts, consisting of a shaft with a fast and loose pulley to receive motion by means of a strap from the moving power, whether water, steam, horse, or hand: the latter, of course, being least desirable, will only be used, when neither of the others is available. Upon this shaft is placed the fly wheel, the momentum of which, during one revolution at the rate of sixty per minute, is found, on trial, to be quite sufficient to overcome the resistance offered by the piece whilst subjected to the pressure of the dies. Upon the same shaft is the crank, which gives motion, through the pitman, to a lever and toggle-joint, the structure of which is exhibited in the left upper corner of the front view presented in figure 2. The feeding of the blanks, or planchets, and their discharge after being struck, is performed by an excentric and set of levers, all combined in so simple a manner, as to be effectual, and not subject to derangement; as much so these parts as are visible in the two views, are faithfully exhibited; but it is impossible to describe them intelligibly without the aid of drawings of the separate parts; and, further, since the drawings were executed, changes have been made in the position and form of the excentric, by which the press is much improved. A general notice is all that is intended in the present communication. The feeding tube is a vertical pipe to receive the blanks, in which they are placed by hand, and from which they are taken by the feeders; the latter are so arranged, that when a crooked, or otherwise faulty blank impedes the motion, (not an unfrequent occurrence in coining,) the whole is immediately released from action, and will not again operate until the impediment be removed. A few familiar facts are added as evidences of the peculiar adaptation of the toggle-joint to coining, as proved by the operation of the press which is the subject of this notice. 1. The pressure acts with increasing force until the close of the operation, at which time its intensity is greatest, and it is always carried to the same extent. 2. No injury occurs from the absence of a blank from between the dies when the blow is given, an accident that results in the destruction, or great injury, to one, if not both of the dies, in presses of the ordinary construction. 3. An immense saving of labor — From trial, we have ascertained that a man, with one hand applied by means of a common winch handle, can coin eighty pieces per minute (the experiment was tried upon cents, which have a diameter of 1 inches). A boy, fourteen years of age, was able to coin sixty per minute, without any unusual exertion; and, lastly, it was impossible for the operator to tell, by the resistance offered to his exertions, whether the pieces were being coined or not. It is by no means my wish to be considered the first who has applied the toggle-joint to the striking of coin. It is difficult to say to whom priority belongs; for presses on similar principles are in use in more than one city in Germany, and their successful operation was witnessed at Carlesrhue, in the Grand Duchy of Baden. Particular advantage has also been derived from a careful examination of the coining presses of Monsieur Thonnellier, of Paris. It is just to observe, that none of these presses were perfectly satisfactory. I have, therefore, made my own distribution and proportion of parts, thrown off whatever was complex, and added such as were necessary to its perfection, particularly the arrangement for the disengagement of the feeders in case of the presence of defective pieces. Our esteemed friend and fellow-citizen, Mr. M. W. Baldwin, several years since, commenced the construction of a press on similar principles. His talents and mechanical skill are amply sufficient for its completion; and it is to be regretted, therefore, that his numerous occupations have prevented the prosecution of the subject. I take advantage of the present occasion, to make a few remarks on the application of steam power to coinage, as applied in the Royal Mint, on Tower hill, London, which is one of the greatest curiosities in mechanics that I have ever seen, exhibiting consummate skill and great resources, on the part of the inventor, who, if I am not misinformed, was Mr. Boulton, of Soho Works. For a series of years this machinery was kept rigidly secret; some even of the officers of the Mint not having the favor of seeing it accorded to them, and it might yet have remained so, if it were not for the advancement of liberal principles, which bid fair to keep pace with the rapid increase of mechanical ingenuity, and skill. The direct application of high steam to the screw press, would have answered every purpose, but still better the substitution of the toggle-joint for the screw has rendered all this ingenious complexity unnecessary; but mechanicians may make their own inferences from the following sketch. A low-pressure engine is employed to create a vacuum in a large receiver, (in this case a misnomer,) by means of an air pump, which serves as a reservoir of power, through the agency of which, the pressure of the atmosphere is exerted as occasion requires, both for the blow and recoil of the screw press; the former produced by a cylinder and piston, furnished with valves, one of which opens to the reservoir, and the other to the external air; the latter, by a cylinder and piston, constantly acting, but with less power than the former. The valves are moved by levers which are struck at a proper time by a plug frame of similar construction to those employed in the ancient atmospheric engine. The power is communicated to the screw by tumbling shafts, connecting rods, and levers, the construction and operation of which could not be rendered intelligible without full drawings for reference. More words would, perhaps, render this brief notice as mysterious as the contrivance of which it treats; I will, therefore, close, by adding that eight of these systems, attached to eight screw presses, constitute the coining power of the British Mint. The Large Cent Coin shows with Mr. Peale’s diagram of the new steam coin press of 1836.